How about the battery back-up? zombie:-B, 18 Aug 2012the battery life of xmp is really poor . whatever you do you have to keep it in charge every ... morethanks for replying..i have heared a lot about its poor battery back up but can you exactly tell me about its browsing and video playback time..thanks. Yes, i wanna know how many hours this phone can stand when used on browsing? How many hours? AnonD-65079, 18 Aug 2012Hey guyz ,please give me a clear idea about its battery life ..how much time it lasts while vi... morethe battery life of xmp is really poor . whatever you do you have to keep it in charge every day in order to use it the next day . Can anyone please tell how to enter the Recovery Mode on this phone??? I can't seem to figure it out, and couldn't find any useful into on the internet. Thank you!! I have updated to ICS it's working awesome.Battery life is been increased after updated. 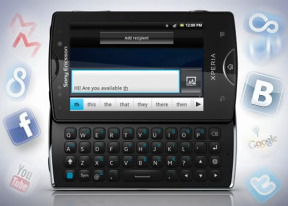 I am planning to sony ericsson.which one should buy?se xperia mini pro or se live with walkman? AnonD-65637, 15 Aug 2012gta3 is a dualcore game,the mini pro have onecore processor,so sure you will have problems....No man , gta 3 can be played on our xmp . Even mobiles with less hardware such as galaxy mini , lg optimus one supports gta 3 . Search these on youtube .